The darling of the blogosphere this past week (links on Lifehacker and Cool Tools for starters) was the Uni-Ball Kuru Toga mechanical pencil. I have had mine for a month or so, but never got around to reviewing it, so I figured now was as good a time as any to take it our for a spin. Before getting into the lead rotation that makes this pencil so popular, let me first say it that it is a fine mechanical pencil in its own right. The barrel is a sturdy plastic that feels like it can take a beating, and the clear grip, which is plastic as well, is surprisingly comfortable. The eraser is a little wobbly in action, but nothing too terrible. The real selling point of this pencil is the mechanism contained beneath the grip section that rotates the lead while writing, all in an effort to keep a sharp and consistent point. The idea is that every time you press the lead to the page, the core rotation mechanism kicks in and rotates the lead to keep a sharp point at all times. This is great in theory, but how is it in practice? Not bad, but not perfect by any stretch. I have the 0.3mm model, and with such a fine lead and the fast pace at which I write, I think I was missing some of the rotation. It would catch up eventually, and combined with my natural rotation (It was all I could do to not rotate the pencil in my hands - much harder than you think!) the lead stayed sharp more often than not. 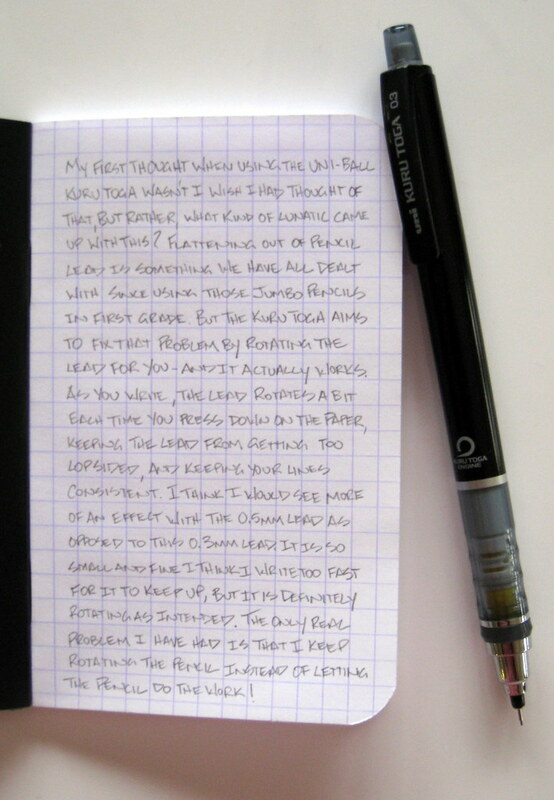 I think I would see better rotation with the 0.5mm lead and a little more writing pressure. I felt I had to be delicate with the 0.3mm. Overall, this is a very nice pencil, and well worth the $6.75 at JetPens even without the core rotation mechanism. Add that little extra and you have a great pencil you can show off to others, but be warned - you will probably spend more time looking to see if your lead is even than you will actually writing or drawing. JetPens is sold out at the moment, but you can be notified when it is back in stock by clicking the link on the product page. Dave's Mechanical Pencils did a very thorough review of the Uni-Ball Kuru Toga back in April that is well worth checking out, and includes a full scan of the insert. Posted on December 15, 2008 by Brad Dowdy.